The Society of Friends or Quaker Collection makes up a part of our rare books collection. It was initially accepted on deposit in 1973 and then gifted to Auckland Libraries in 1995 for safe keeping for posterity. The collection came from the library of the Society of Friends in Auckland, and consists of some 300 books including a copy of the Breeches Bible printed in 1608 and another Bible printed in 1653. Other rare and significant works form part of this collection including 43 books printed before 1801. 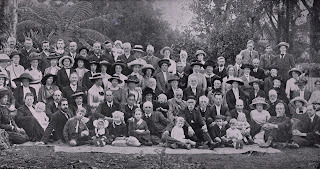 As one would expect, most items in the Quaker Collection are concerned either with the history, principles and precepts of the Society of Friends or with the lives of outstanding Quaker personalities. These include a well-worn copy of George Fox’s Journal printed in London in 1694. 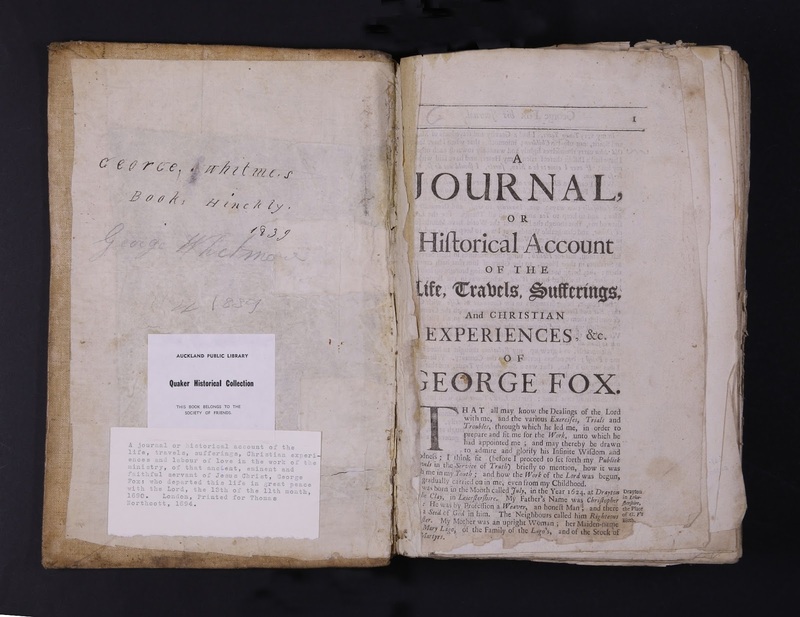 George Fox was a founder of the Society of Friends and his journal is a central document in Quakerism. Ref: George Fox, A journal or historical account of the life, travels, sufferings etc., 1694, Sir George Grey Special Collections, Auckland Libraries, 272.8 F79. The collection also includes books on Christian life and religious instruction – and a few biographies (such as Dorothy Ripley’s) – written from a general Protestant rather than specifically Quaker perspective. The Society of Friends did not produce their own translation of the Bible; they were content to use the Geneva and King James versions. The Geneva Bible, which preceded the King James translation by 51 years, is also known as the Breeches Bible. 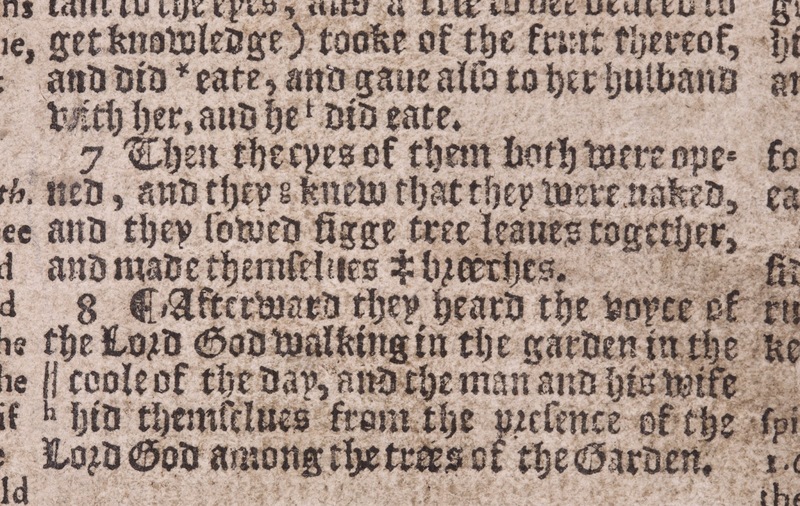 This is because in the Breeches Bible, Genesis Chapter III Verse 7 reads: "Then the eyes of them both were opened, and they knew that they were naked, and they sewed figge tree leaves together, and made themselves breeches." In the King James Version of 1611, "breeches" was changed to "aprons". 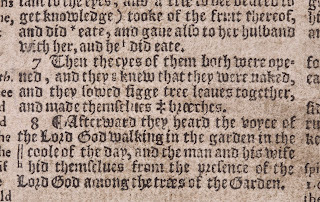 Ref: Bible, English, Geneva version, 1608, Sir George Grey Special Collections, Auckland Libraries. The collection also contains several books by non-Quakers on social issues with which the Society of Friends has long been involved – temperance, pacifism, the anti-slavery movement, a federation of nations. These include a first edition of All quiet on the Western Front and works by prominent anti-slavery campaigner Thomas Clarkson. 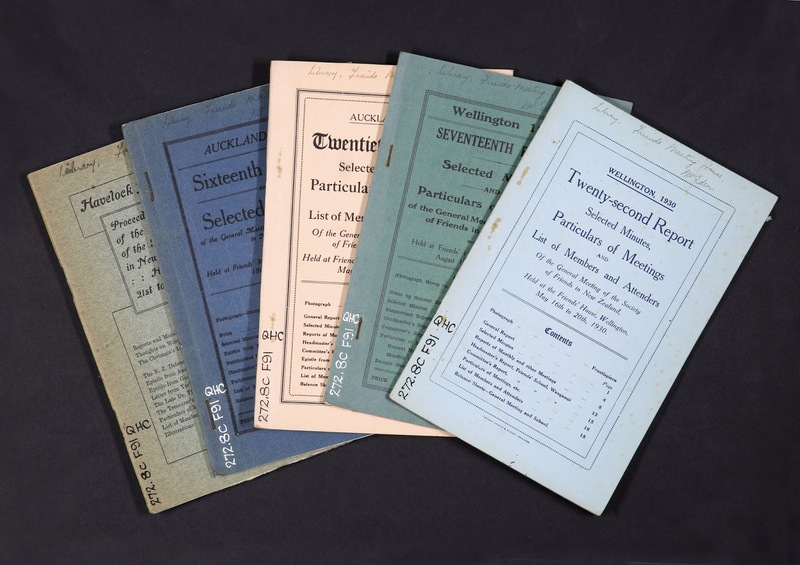 Also included is a set of Reports of the General Meeting of the Society of Friends running from 1912 through to 1956. Ref: Society of Friends, Report of the General Meeting, 1912-1956, Sir George Grey Special Collections, Auckland Libraries, 272.8 F91. These publications could be of interest to those of you who have ancestors who were in the Society of Friends as these reports contain lists of the members of the Society and attendees at the meetings complete with street addresses, family members and occasionally professions too. 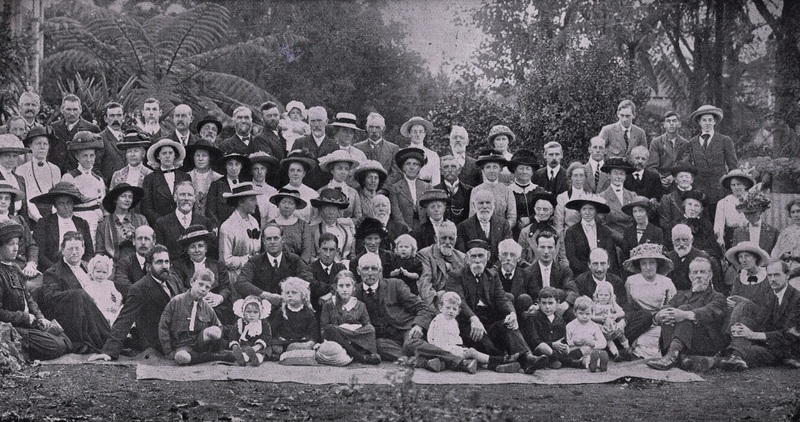 This group portrait is from the 1914 meeting in Auckland. Ref: Society of Friends, Report of the General Meeting, 1914, Sir George Grey Special Collections, Auckland Libraries, 272.8 F91. The reports covering the First World War years are of particular interest as they have lists of Friends called up for compulsory service under the Military Service Act and these lists contain details of what transpired to each individual after their appeals were heard. The 1917 report includes the Society of Friends’ manifesto issued around alternative service for conscientious objectors. This points out and emphasises the fact that as they proceeded through courts and places of detention, the spirit of love brought strength to their own hearts and won the respect of the Authorities.